Last year, 280 million tonnes of plastic was produced globally. But less than half of it reached landfills or was recycled. The remaining 150 million tonnes may be found littered on land and in oceans. A team of scientists has offered a solution to deal with plastic waste that can harm all sea turtle species, 45 per cent marine mammal species and 21 per cent seabird species, as reported by the secretariat of the Convention on Biological Diversity in Montreal, Canada. According to the recent report published in the journal Nature on February 14, the team of 10 scientists write that labelling some plastics such as Polyvinyl chloride (PVC), polystyrene, polyurethane and polycarbonate as hazardous would mitigate associated health risks and protect wildlife. This would also help environmental agencies restore the affected habitats and prevent more dangerous debris from accumulating. It is an outdated viewpoint to consider plastic as inert as plastics are laden with highly toxic pollutants, the authors of the paper say. The report claims that if current levels of plastic consumption and production continue, there could be an additional 33 billion tonnes of plastic by 2050. The report estimates that this amount can be reduced to four billion tonnes if plastics are classified as hazardous. The paper states that plastic cannot be considered as a non-hazardous product because more than 50 per cent of plastics contain chemicals that are toxic and they are released into the environment after they are discarded. Moreover, plastic debris is not biodegradable, it is photo-degradable, making all the plastic debris fragment into smaller and smaller pieces that can easily be confused by organisms in seawater or freshwater as food. As plastic breaks down into microscopic fibers, it can be inhaled or ingested by humans and wildlife. One study found that such microscopic fibers were present in human lung cancers. Seabirds that have consumed plastic waste have 300 per cent greater concentrations of polychlorinated biphenyls (PCBs) in their tissue than other birds. 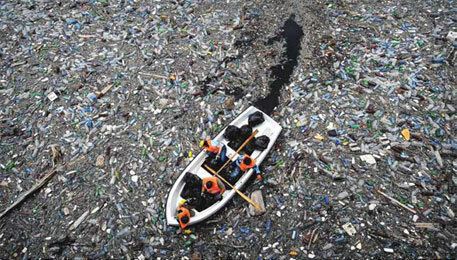 The report also mentions some of the glaring loopholes that exist in some of the treaties such as the International Convention for the Prevention of Pollution From Ships (MARPOL)—it brought together 134 nations and bans plastic disposal at sea but the problem has persisted or worsened. The report also mentions an approach similar to phasing out of chlorofluorocarbons (CFCs) in seven years by reclassifying them as hazardous under the Montreal Protocol of 1989 and the Stockholm Convention of 2004 is adopted. With developing countries struggling to deal with recycle and reuse of plastic and the developed world spending millions of dollars in its recycling, time has come to invest in research for the production of safer materials and better alternatives. “We feel that the physical dangers of plastic debris are well enough established, and the suggestions of chemical dangers sufficiently worrying, that the biggest producers of plastic waste — the United States, Europe and China — must act now,” the report concludes. “There are big benefits in doing a new classification of plastic debris as a hazardous pollutant. Among these benefits are the reduction of the use of petroleum for plastic production, eliminating tonnes of waste and keeping the planet clean, people eating safe seafood, going to clean beaches and countryside and economically saving public money,” says Lorena M Rios, one of the co-authors. Chelsea M Rochman and Mark Anthony Browne, authors of the paper add that in the US, more disposal facilities actually caused more waste. Developing countries like India can adopt international leadership on this issue by drafting new policies that create incentives for industry that phase out plastic and switch to safer alternatives, these simple policy-changes in India will create a domino effect that will affect markets globally, they say. Waiting to see how the food-safe plastics will be classified, if this idea is legislated.